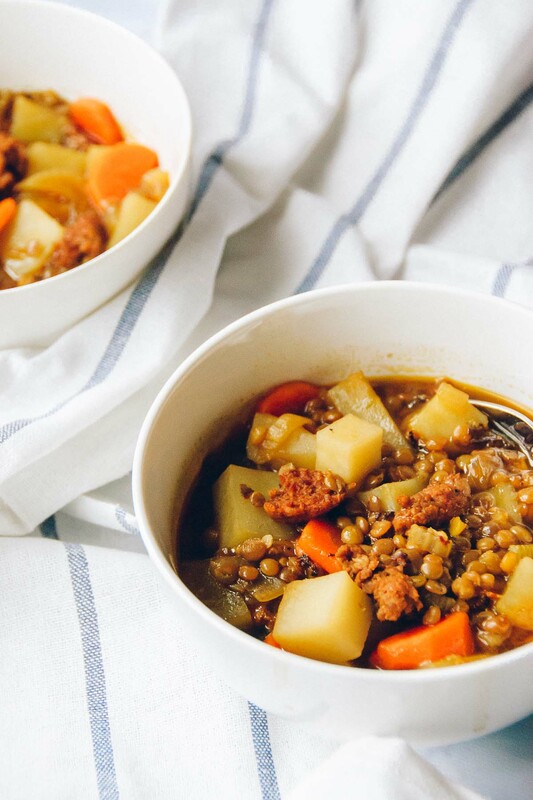 Hearty lentil soup with a good dose of sausage for the meat lovers in the crowd! 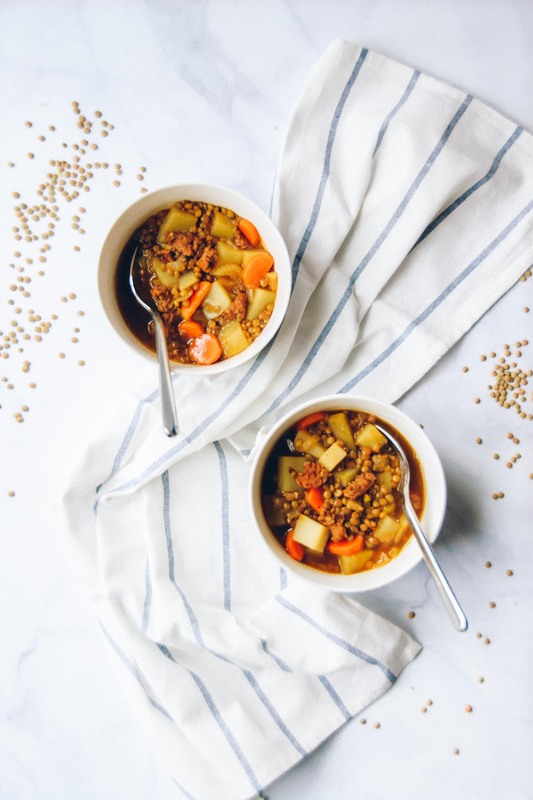 This Spicy Sausage Lentil Soup is perfect for fall and winter meals! 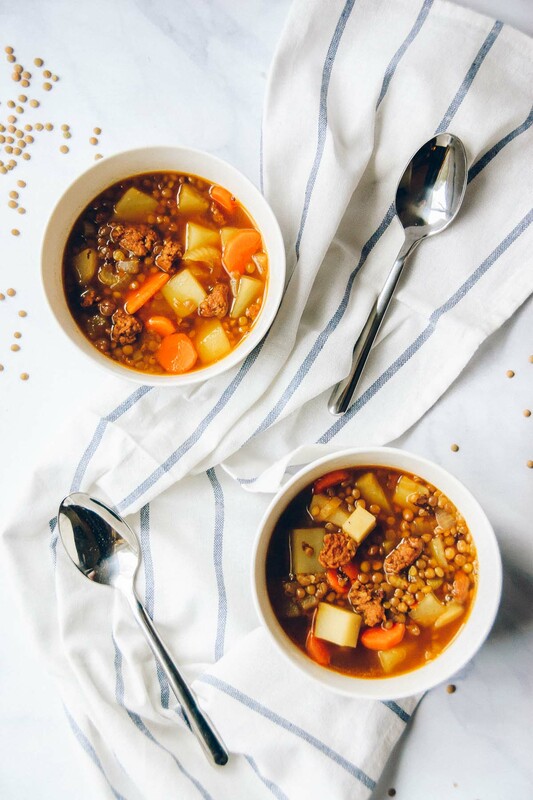 I confess I made this soup not thinking it would be a blog recipe, but then it was SO. GOOD. It was also SO. SIMPLE. and it was great as leftovers! So guess what?! 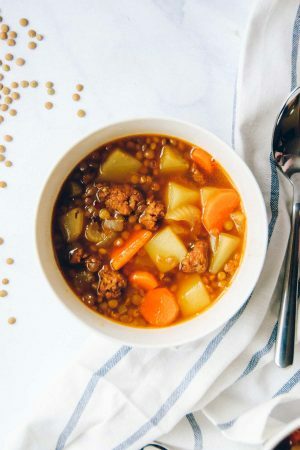 You get this Spicy Sausage Lentil Soup recipe today! Yay! What makes the recipe: Lentils and Spicy Sausage. 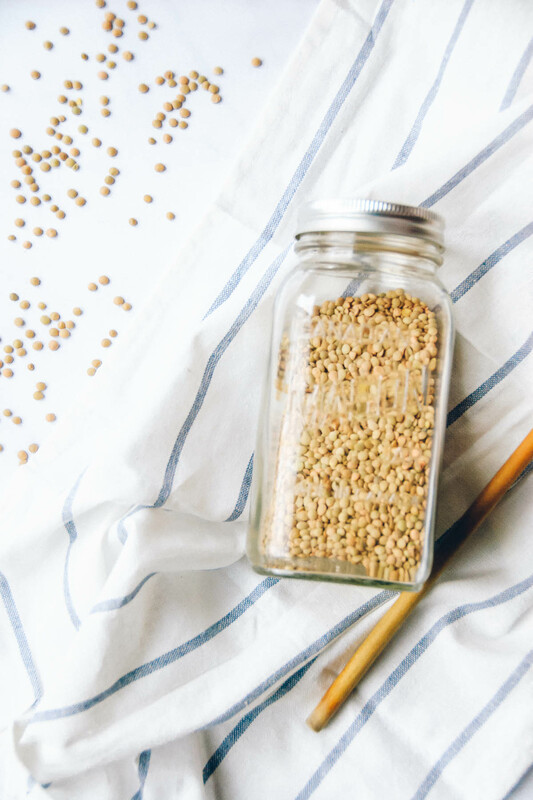 So many people have not learned about the wonders of lentils. They are a wonder legume and pulse that pack a mean punch of protein and keep you full… almost to the point where the spicy sausage is not needed. But in this recipe, the sausage adds a yummy kick of flavor and also kicks people who think that a bowl of soup cannot be a complete meal. YO. IT. CAN. and it is GREAT. I do it all the time. It’s tagged cooking for two because it can serve two hungry people for Sunday lunch or a weeknight dinner (in less than an hour no doubt!) and then can serve both those people for lunch the next day – my type of recipe! In a dutch oven or large pot, heat oil over medium-high heat and brown the sausage, about 5 minutes. Add onions, celery and carrots and saute until translucent, another 5 minutes. Add the broth and water and bring to a boil. Once boiling, add the lentils and simmer with the lid on for about 20 minutes. Next, add the potatoes and simmer for 10 minutes more, at this time the lentils will be cooked and the potatoes tender. Serve.